We’ve all swung on a rope swing at one time or another, usually as youngsters or young adults enjoying a nice day amongst friends swimming and frolicking in a river or lake. But daredevils can take a placid experience and turn it into a life-threatening thrill. This is the story of Utah’s Corona Arch and the Gemini Bridges – filled with intrigue and tragedy. The world’s largest rope swing was created at the Corona Arch near Moab, Utah, which is also home to Gemini Bridges and the Rainbow Bride National Monument, the largest natural stone span in the world. The Corona Arch is made up of natural sandstone and sits at the side of the Colorado River, about a 1.5-mile hike from Utah Route 279. The Corona Arch is about 140 feet tall. This number is important because daredevils swinging into the opening must accurately calculate the length of rope needed for a safe jump: not too long, not too short. 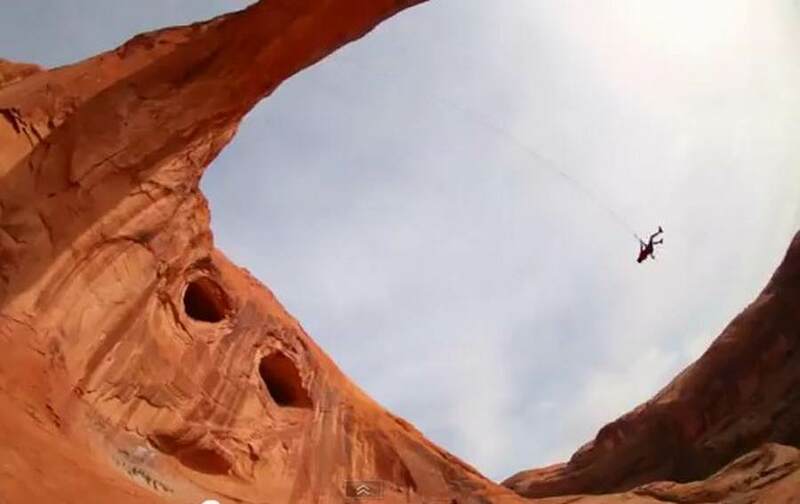 Sadly in 2013 22-year-old Kyle Lee Stocking overestimated the amount of rope needed for the swing and crashed into the base of Corona Arch, dying shortly after. A number of other daredevils crashed too, some ending up with barely a scratch and others who are spending the rest of their lives in long-term care. According to the San Jose Mercury News, the US Bureau of Land Management office in Moab, Utah began assessing the Corona Arch and Gemini Bridges a couple of years ago to determine if rope jumping should be permitted or not. Finally, early last year, the Bureau of Land Management banned the activity. The following video, “Worlds Largest Rope Swing,” has more than 26.5 million views on YouTube.